Diller was born into a Jewish household in San Francisco, California, and is the son of Reva (née Addison) and Michael Diller. Diller began his career through a family connection in the mailroom of the William Morris Agency after dropping out of UCLA after three weeks. His proximity to the company's file room meant that he could spend free time reading through the archives and learning the entire history of the entertainment industry. He was hired as an assistant by Elton Rule, then west coast head of ABC, who was promoted to network President at the same time Diller went to work for him in 1964, taking him on to New York City. Diller was soon placed in charge of negotiating broadcast rights to feature films. He was promoted to Vice President of Development in 1965. In this position, Diller created the ABC Movie of the Week, pioneering the concept of the made-for-television movie through a regular series of 90-minute films produced exclusively for television. Diller served for 10 years as the Chairman and Chief Executive Officer of Paramount Pictures Corporation starting in 1974. 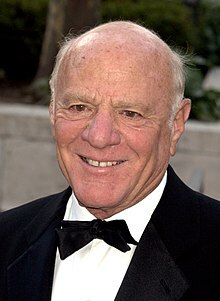 With Diller at the helm, the studio produced hit television programs such as Laverne & Shirley (1976), Taxi (1978), and Cheers (1982) and films that include Saturday Night Fever (1977), Grease (1978), Raiders of the Lost Ark (1981) and sequel Indiana Jones and the Temple of Doom (1984), Terms of Endearment (1983), and Beverly Hills Cop (1984). From October 1984 to April 1992, Diller held the positions of Chairman and Chief Executive Officer of Fox, Inc., the parent company of Fox network and 20th Century Fox, where he greenlighted megahit shows such as Married... with Children and The Simpsons. Diller quit 20th Century Fox in 1992 and purchased a $25 million stake in QVC teleshopping network. He then launched a bid to purchase Paramount Communications, but lost it to Viacom. Diller resigned from QVC in 1995. In 1997, Diller acquired the assets of Silver King Broadcasting, the collective group of over-the-air TV stations owned by then Bud Paxson's Home Shopping Network as well as the Home Shopping Network itself. Along with this acquisition, Diller also purchased the rights to the USA Network from the Bronfman family. Due to Home Shopping getting more notoriety on the cable networks from his former dealings with the QVC Network, Diller sought to repurpose the broadcast stations into independent, locally run stations as part of a station group dubbed USA Broadcasting of which the flagship station was WAMI-TV in Miami Beach, Florida. The purpose of the network was to have the flagship, WAMI, produce sports and news programming while testing locally produced general-interest programming for the other stations in the group. Due to the high costs of producing and acquiring talent for shows outside the typical areas of New York City and Los Angeles, plus the significantly low ratings such shows received in Miami Beach, the remaining shows were moved to Los Angeles to regain traction, but never did. Diller eventually sold the TV assets to Univision after rejecting a bid from The Walt Disney Company. The USA Network and its assets were later sold off to Vivendi. Diller retained the assets of the Home Shopping Network and the subsequent Internet assets he acquired later to bolster the HSN Online stable that later became IAC/InterActiveCorp. Diller was the Chairman of Expedia and the Chairman of IAC/InterActiveCorp, an interactive commerce conglomerate and the parent of companies including HomeAdvisor, Match.com, Citysearch, and Connected Ventures, home of Vimeo and CollegeHumor. IAC/InterActiveCorp is also the parent company of Tinder, UrbanSpoon, The Daily Beast, and more. In 2005, IAC/InterActiveCorp acquired Ask.com, marking a strategic move into the Internet search category. He stepped down as Chief Executive Officer of IAC/InterActiveCorp on December 2, 2010. The new headquarters for the IAC/InterActiveCorp, the IAC Building was designed by Frank Gehry and opened in 2007 at 18th Street and the West Side Highway in Manhattan's Chelsea neighborhood. The western half of the block is dedicated to the building, which stands several stories taller than the massive Chelsea Piers sporting complex just across the West Side Highway. The extra floors guarantee a panoramic Hudson River view from Diller's sixth-floor office. Diller has been on the board of Coca-Cola since 2002. In 2003, on the PBS program NOW with Bill Moyers, Diller voiced a strong warning against media consolidation. In the interview he referred to media ownership by a few big corporations as an oligarchy, saying the concentration strangles new ideas. Diller was "the highest-paid executive [of fiscal year 2005]", according to a report by The New York Times on October 26, 2006, with total compensation in excess of $295 million (mostly from stock). In an opinion article in The New York Times of November 7, 2006, Nicholas D. Kristof awarded him his annual Michael Eisner Award, consisting of a five-dollar shower curtain, for corporate rapacity and laziness. Diller is responsible for what the media dubs "The Killer Dillers" – people whom Diller mentored and who later became big-time media executives in their own right. Examples include Michael Eisner (who was President of Paramount Pictures while Diller was its Chairman & CEO, and went on to become Chairman & CEO of The Walt Disney Company), Dawn Steel (future head of Columbia Pictures and one of the first women to run a major movie studio, who worked under Diller at Paramount), Jeffrey Katzenberg (head of DreamWorks Animation, principal of DreamWorks SKG, former head of Walt Disney Studios, and a head of production of Paramount under Diller), Garth Ancier, President of BBC America, and Don Simpson, who was President of Production at Paramount under Diller and Eisner and later went on to run a production company based on the Disney lot with Jerry Bruckheimer. Diller worked with Stephen Chao at Fox Television Network, whom he later hired as President of Programming and Marketing at USA Network. Julius Genachowski, chairman of the Federal Communications Commission, served as Diller's General Counsel during their tenure at USA Broadcasting, and again as Chief of Business Operations and a member of Barry Diller's Office of the Chairman at IAC/InterActiveCorp. In 2001, Diller married fashion designer Diane von Fürstenberg, mother of Prince Alexander von Fürstenberg and Princess Tatiana von Fürstenberg. He is a member of the Democratic Party and supporter of related political causes. As of January 2018, Diller's estimated net worth was $3.3 billion. Diller is a critic of President Donald Trump. In 2011, the Diller-von Furstenberg Family Foundation announced a donation of $20 million to support the completion of the High Line park project in Manhattan. In 2012, Diller donated $30 million to the Hollywood Fund, which provides health and social care to retired individuals from the show-business world. In 2015, Diller and his wife committed to donate $113 million toward a floating public park and performance space on a pier in the Hudson River, New York. It is stated to be the largest donation to a public park in New York's history, with completion estimated around 2019. ^ a b Forbes. "Profile: Barry Diller". Retrieved 2018-11-08. ^ "Bloomberg Business". Bloomberg.com. Archived from the original on 2010-01-06. ^ "Barry Diller Biography". filmreference.com. Retrieved February 12, 2018. ^ Reported on the American CBS network's 60 Minutes, re-broadcast June 10, 2007. ^ "Barry Diller: Infinite learner | Masters of Scale Podcast". WaitWhat. Retrieved 2018-03-20. ^ Karol, Michael (June 2005). The ABC Movie of the Week Companion: A Loving Tribute to the Classic Series. iUniverse. p. XIX. ISBN 978-0-595-35836-6. Retrieved October 10, 2010. ^ Bernard Weinraub (December 23, 1993). "THE PARAMOUNT DEAL; What Surprise? Friends Say Diller Always Defies Odds". The New York Times. ^ Alan Citron and John Lippman (February 25, 1992). "Diller Stuns Hollywood, Quits Fox Inc". Los Angeles Times. ^ Mark Landler (May 20, 1996). "Barry Diller Used to Work Here?". The New York Times. ^ "Barry Diller: Learn to unlearn | Masters of Scale Podcast". WaitWhat. Retrieved 2018-03-20. ^ Amy Thomson (December 2, 2010). "Diller Exits IAC CEO Role as Malone Exchanges Stake". Bloomberg.com. ^ PR Newswire (March 4, 2002). "The Coca-Cola Company Nominates Barry Diller and Robert Nardelli for Election To Board of Directors". PR Newswire. ^ "Moyers on America". PBS. ^ , Marketwire.com; accessed October 28, 2006. ^ Fabrikant, Geraldine (October 26, 2006). "Diller Takes the Prize for Highest Paid". The New York Times. The New York Times Company. ISSN 0362-4331. Retrieved October 3, 2015. ^ Kristof, Nicholas (August 14, 2005). "Announcing an Award for Greed". The New York Times. The New York Times Company. Retrieved September 22, 2014. ^ Nicholas D. Kristof, America’s Laziest Man?, The New York Times, November 7, 2006. ^ Mair, George (17 June 1998). The Barry Diller Story: The Life and Times of America's Greatest Entertainment Mogul. John Wiley and Sons. pp. 71–87. ISBN 978-0-471-29948-6. Retrieved 10 October 2010. ^ Justin Menza (September 25, 2012). "Why I'm Voting for President Obama: Barry Diller". CNBC. ^ Balakrishnan, Anita (2017-07-12). "Media mogul Barry Diller on Trump: 'I think it's just a joke. Hopefully it will be over relatively soon.'". CNBC. Retrieved 2018-01-04. ^ "Diller-von Furstenberg Family Foundation Awards $20 Million to Help Complete High Line Park". philanthropynewsdigest.org. 28 October 2015. ^ "Media Mogul Barry Diller Gives $30-Million to Hollywood Fund". philanthropy.com. June 6, 2015. ^ "Hudson River's $130million Floating Park". Business Insider. February 15, 2015. ^ "Diller-von Furstenberg Foundation: New York City Grants". insidephilanthropy.com. December 2, 2015. "Diller, Barry". The Museum of Broadcast Communications. Retrieved 14 July 2006.